Ever wondered if the airplanes shown in sci-fi films (typically the Steven Spielberg movies) can come into reality? Well, not exactly; but there are some futuristic airplanes which will have interesting interiors, which will give you a feel of a sci-fi film. 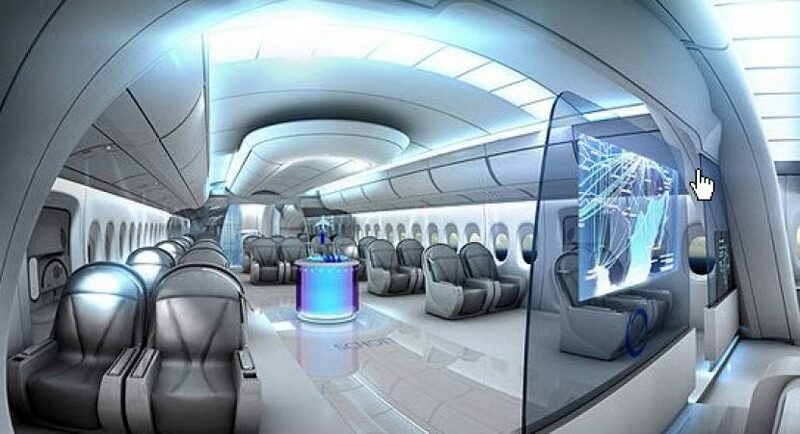 Here are some of the future airplanes interiors which will leave you awestruck. Most of these features in future airplanes are designed for long-hauled flights. Passengers’ comfort is kept on the utmost priority while including these features. However, to see these features in reality will take some time. Here is a list of features of interiors of future airplanes. Some of them are really innovative. 1. 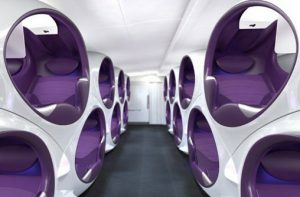 Cocoon-like individual sleeping arrangements: Passengers will be able to experience the first class environment with these uniquely designed sleeping arrangements. These designs are laid by a company called ’Air Lair’. These sleeping arrangements will be in a cocoon style. The passengers will be able to control the light and temperature in their ‘cocoon’. Cocoon styled seats will be able to utilize the interior space of the airplanes better. This will certainly be an expensive affair, though! 2. Virtual reality for entertainment: Providing Netflix or other internet-based entertainment channels may not be new. However, the future airplanes might have virtual reality as your entertainer. 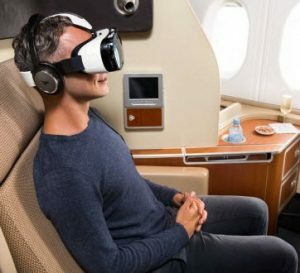 Though currently there is a little possibility to implement this, there are some airlines which are testing virtual reality in their flights. These include Transavia, the budget airline run by Air France/KLM, and the Australian company Qantas. 3. Personal entertainment system: Future airplanes will be more about passengers’ personal experience on the flight. Hence, every small thing from comfort to entertainment will be taken care by the airlines in future. One of these futuristic facilities will be personal entertainment system. Watching movies played by the airline is a passé. In future, passengers will be able to connect their own devices to the aircraft’s devices. 4. Seats like a movie theater: The typical movie theater seats fold up when not in use. You might see the same concept applied in the future airplanes also. An Italian company, ‘Aviointeriors’ is designing special airline seats that will fold up when no passenger is sitting in them. For the economy class, this will be a space saver feature. Comfortable seats with VR: An amalgamation of above two features is comfortable seats with a VR. Thanks to this feature, passengers will be able to enjoy luxury, comfort, and entertainment; all at once. In-flight help system: The future airplanes will come with several technological advancements embedded in them. One of them will be an in-flight help system. With this system, passengers will be able to make duty-free purchases, order food, select movies to watch and read magazines online. 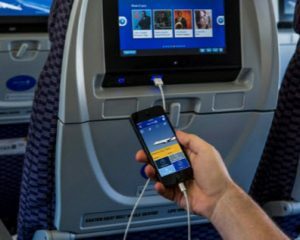 In fact, Dutch company AirFi has already equipped its low-cost airlines with a special wireless system that uploads passenger information directly to the passengers’ device. These futuristic designs are not far away. Few years down the line, we will definitely see these and many other revolutionary features and designs in the future airplanes.